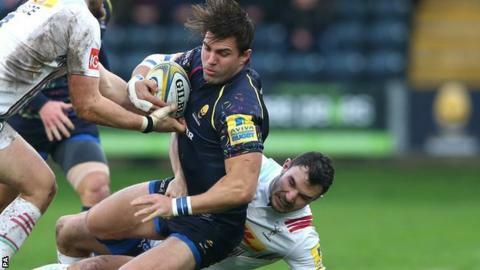 Worcester Warriors centre Wynand Olivier has signed an undisclosed-length deal with the Premiership club. The South Africa international, 32, originally signed on at Sixways in September, following his release by French Top 14 side Montpellier, reportedly on a two-year contract. He has so far scored one Warriors try in nine Premiership appearances. Warriors have also promoted 21-year-old Academy utility back Perry Humphreys to a first-team squad contract. Humphreys, who can play at full-back, wing and centre, was signed from Leicester Tigers in the summer of 2014, making his debut for Warriors in their Championship win at Rotherham in October. He has since registered two tries in first team appearances, scoring in the semi-final to help the Warriors win last season's British & Irish Cup. After 11 straight defeats - six in the Premiership, five in the European Challenge Cup - Worcester stand 10th in the Premiership. They are just four points off the bottom, ahead of this Sunday's league visit to Premiership backmarkers London Irish.